1. Hide Your Heart - Some of the strongest lyrics in the KISS catalogue. A great song, and even a moderate hit in the early 90's. Deserves to be more famous. It has been covered multiple times, which would suggest it's a good song. 2. Magic Touch - A great Paul Stanley-penned obscure classic that comes out on the occasional acoustic set. A really strong tune. Look out for the superb falsetto part toward the end of the song. 3. A Million To One - A very good power ballad with very powerful lyrics and great singing. It truly deserves to be more famous. These top three songs was all performed during Paul Stanley's solo club tour in 2006 where they were performed the way they should be, perfect - so look it up! 4. 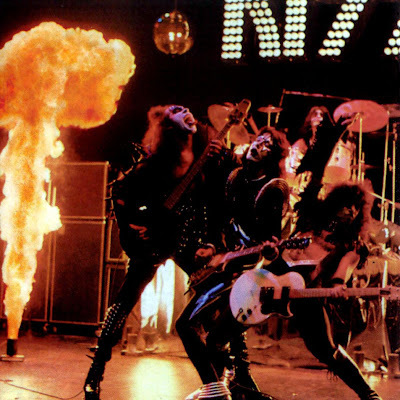 Nowhere To Run - could be Paul Stanley's best vocal performances ever caught on a KISS album. Packed with power and emotion. 5. Thrills In The Night - a very underrated song that even Paul Stanley is said to hate. Oh, but he's wrong is all I can say. Great verses and a huge chorus and superb vocals. I love this song! 6. Mr Speed - a very fun song with a great riff and sexually loaded lyrics. A loved fan favorite! 7. Let Me Know - one of few songs from the self-titled debut album that didn't survive in the setlists over the years. A shame, because it's truly an early career gem! 8. Every Time I Look At You - an overlooked ballad that has all the qualities to be a hit song, which it should have been. Awesome stuff. 9. Rock And Roll Hell - a Gene Simmons-sung heavy song from the early 80's. Co-written by the Bryan Adams, sadly it has never been played live. 10. The Oath - from the hated album The Elder comes this gem. This is pre-heavymetal. Replace the falsetto singing with a growler and you'll have yourself a modern day metal song. 11. Exciter - first song of the band's unmasked period really sets the tone with this energetic hard rocker. Great guitar playing and strong vocals. One of the best from 80's KISS. 12. Silver Spoon - one of few self-portraying KISS songs about Paul Stanley's upbringing in New York is quality material with a strong set of lyrics. 13. I'll Fight Hell To Hold You - a vocal circus number, with a Paul Stanley at the top of his vocal game. During this period Paul was probably second only to Freddie Mercury himself. 14. Dreamin' - the most recent song on the list, from 1998's Psycho Circus. A very good song that is just impossible to dislike. Top notch vocals! 15. Dirty Livin' - a Peter Criss-penned and sung song about the frustration he experienced in the band at this time. Peter has a very raspy and cool voice that fits perfectly. 16. I Walk Alone - the only song Bruce Kulick ever got to sing. Great innovative guitar work, lyrics about self-empowerment and going your own way in life. From the obscure album Carnival Of Souls. 18. Thou Shalt Not - a song about telling idiot authorities to f*ck of. How about that? It's the most demon-like KISS song written during the non-makeup era. 19. Tomorrow - the version that ended up on the album Unmasked is very pop-oriented. The demo version that circulates is harder and better, but it's still a great little fun song. 20. Turn On The Night - a huuuge chorus on this keyboard-enhanced song. Great vocals that is sure to widen your smile and improve your mood! The perfect song to end this list with.